Why The Pet Resorts – Dunwoody? At The Pet Resorts we treat your dogs as if they were our own! Our Dunwoody dog boarding location offers a clean, active, and protected refuge for your furry friend to get exercise, relieve stress and have a great time. Our facility is fully climate controlled throughout with fully monitored play yards in full view of our web cam. You can enjoy that vacation or business trip knowing your dog will be in very good hands! I give The Pet Resorts Dunwoody my highest recommendation. I have been going there for one year now since I moved to Sandy Springs. Let me be really clear and blunt. I do not give many compliments, and I am extremely hard to please in both my business and personal life. My dog Dakota absolutely loves The Pet Resorts – Dunwoody. She gets extremely excited when she walks in that door. She loves all the staff there – the Pet Sitters, Daycare professionals, the playground sitters, and the Groomers. I am extremely detail oriented and meticulous as I am an X-Big 4 auditor, and I have been a business owner for 12 years. Thus, I am extremely critical of small businesses. 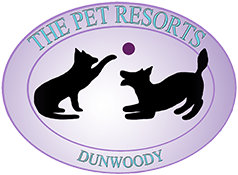 The owner at The Pet Resorts – Dunwoody is extremely friendly. He goes above and beyond for his customers and their pets of course. His Staff always has a positive attitude, and they always roll out the red carpet for their clients. All of the clients that I have come in contact with echo my statements 100%. It is a NO BRAINER to check your dog into the Pet Resorts whether it is for Daycare, overnight boarding, or grooming. A caring staff that gives hours of love and attention and spoils your dog! Reservation booking policy: A Visa, MasterCard, or Discover card will be put on file in our secure system and the first night will be charged as a deposit. We will accept cancellations up until 2 days before your drop off with a refund of your deposit. After that time period, your deposit will be forfeited or credited to a future stay. During holiday periods, a 2-day deposit will be required.